A fresh brewed cappuccino is given a touch of sweetness with a spoonful of dulce de leche. Skip the coffee shop and make our Toffee Cappuccino at home in minutes. 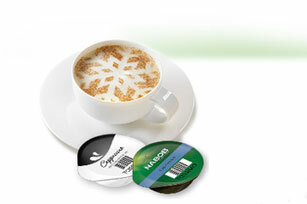 Prepare 1 Coffee T DISC, then 1 Milk T DISC from Tassimo Nabob Cappuccino in mug or large heatproof glass. Stir in 1 Tbsp. dulce de leche. Top with dash of ground cinnamon. Substitute caramel-flavoured ice cream topping for the dulce de leche. Omit cinnamon. Hold a stencil, such as a snowflake design, over mug; sprinkle unsweetened cocoa powder over stencil to create a fun pattern on top of cappuccino.